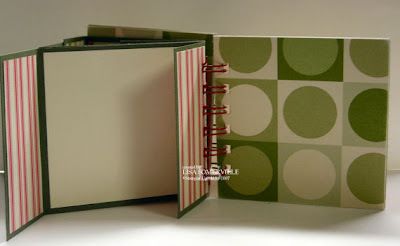 First, let me say, if you are looking for the Funky Vintage Flip Book I posted on Monday - I had to temporarily take it down - look for it to be back up real soon! 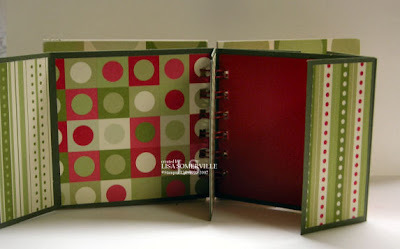 I took a break from designing for my upcoming Trim the Tree Class and made another 4" x 4" Flip Book. These are really fun to make! If I haven't talked you into "needing" Jolliest Time of the Year yet, you might be putting in on your list. 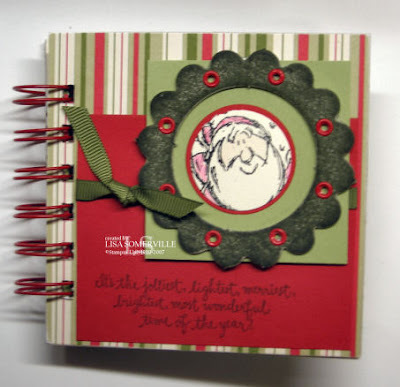 Not only am I using it on the Flip Book shown here, but I'm also using it in my Holiday Card Classes and in the Trim the Tree Class. So, you'll be getting lots of mileage for your purchase. Email me today, to order your set, or sign up for my upcoming classes. The chip board is from the On Board Trimmings in the Holiday Mini, these have been mailed - you should be receiving yours soon. If you haven't gotten your copy, please drop me an email. I LOVE IT Lisa!!! You're going to convince me to get that dang Bind it All pretty soon. ANd Jolliest of Holidays! You've done some amazing stuff with it. Wow Lisa, this is amazing! Your class would be fantastic! Lisa do you think bind it all is worth it? I saw in a store here is realy small. awwww so adorable! 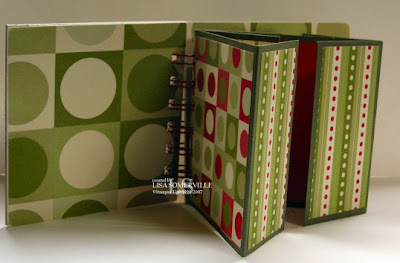 I need that bind it all I have wanted it for so long already...adding it to my wish list for xmas!